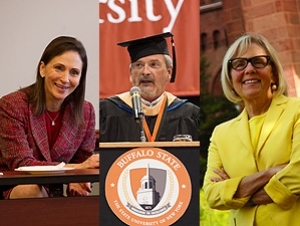 Three of SUNY Buffalo State’s most distinguished alumni—Evelyn Lieberman, ’66; Carolyn Lamm, ’70; and Bill Cleary, ’69, ’73—have something in common: they all trained to be classroom teachers, then used their “teacher skills” to find immense success in other professions. All three agree that the thorough preparation they received at Buffalo State to be a teacher helped propel them to the top of their chosen fields. In short, they say that “teacher skills” translate beyond the classroom. “Preparing to be a teacher is very helpful for any career. You learn how to talk in front of a group. It’s great preparation for addressing a large audience—sometimes a hostile audience—and you learn how to take criticism. You learn how to present with enthusiasm—enthusiasm is contagious. 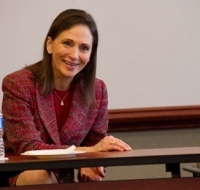 I learned all of that at Buffalo State, and it has been very useful in my life,” said Lieberman, director of communications and external affairs at the Smithsonian Institution, and White House deputy chief of staff in the Clinton Administration. 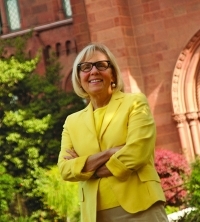 After graduating from Buffalo State, Lieberman taught English at Hicksville, New York, High School for four years until moving to Washington, D.C. There, she changed careers and became a public relations professional. Eventually, she was selected for White House duty. Lieberman received Buffalo State's Distinguished Alumnus Award in 2000. Read more in 1300 Elmwood. Lamm enrolled at Buffalo State to become a teacher, but as graduation approached, she recognized her true calling and applied to—and was accepted at—the University of Miami (Florida) School of Law. Lamm received the honorary doctor of laws from the State University of New York in 2012. After earning his bachelor’s and master’s degrees in secondary education (with a concentration in cultural anthropology) from Buffalo State, Cleary taught American history, anthropology, and African American studies at Lake Shore High School in Angola, New York, from 1972 to 1978. During off-hours, he worked as an advertising copywriter. In 1978, he shifted careers and went on to marketing success in New York City and Silicon Valley. 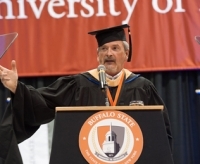 Cleary received Buffalo State’s Distinguished Alumnus Award in 2013.